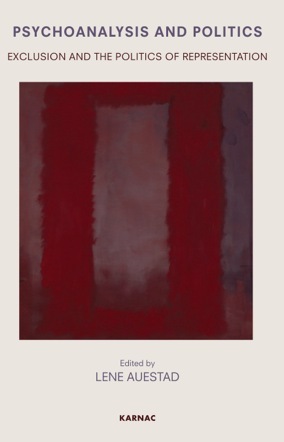 The book poses the question of how psychoanalysis can be used to think about the invisible and subtle processes of power over symbolic representation, in the context of stereotyping and dehumanization: What forces govern the state of affairs that determine who is an ‘I’ and who is an ‘it’ in the public sphere? Thinking in terms of ‘containment’, a communication which is denied a social space for expression can be said to be actively stripped of meaning. Through its original contribution of attending to, and interpreting material that so far had seemed meaningless, psychoanalysis demonstrates a capacity to reinstall meaning where none was before – but how are such acts performed on a social level? When common responsibility is displaced onto a suitable class or group and its representatives, the end point is reached when the individual is objectified and the social aspects of the process are no longer recognized. His or her position becomes an illegitimate one from which to speak – the person’s subjectivity is excluded. The book poses the question of how we can conceive of the ‘how’ and the ‘why’ of this phenomenon and of possible counter-actions. Lene Auestad is Research Fellow in Philosophy at the University of Oslo, and affiliated with the Centre for Studies of the Holocaust and Religious Minorities, Oslo. She moved to the UK to pursue long-standing interests in British psychoanalysis. Working at the interface of psychoanalytic thinking and ethics/political theory, her writing has focused on the themes of emotions, prejudice and minority rights. Recent articles have included ‘To Think or Not To Think’, in the Journal of Social and Psychological Sciences, and ‘Splitting, Attachment and Instrumental Rationality’, in Psychoanalysis, Culture & Society.